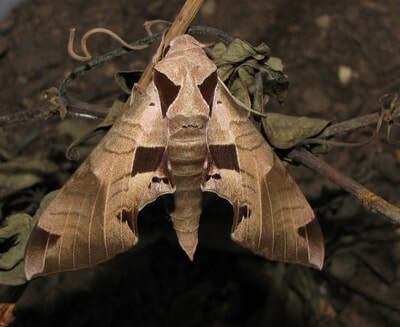 Common Name(s): Achemon SphinxEcology/Life History Overview: This species has one of the largest distributions of Sphingidae in the USA. 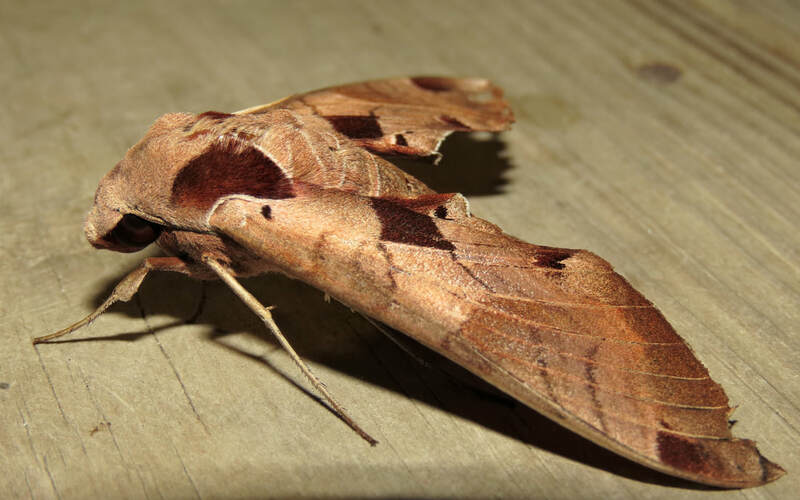 Found essentially throughout the US, missing only from small portions in the Northern US, this moth can virtually be found year round depending on where you go. 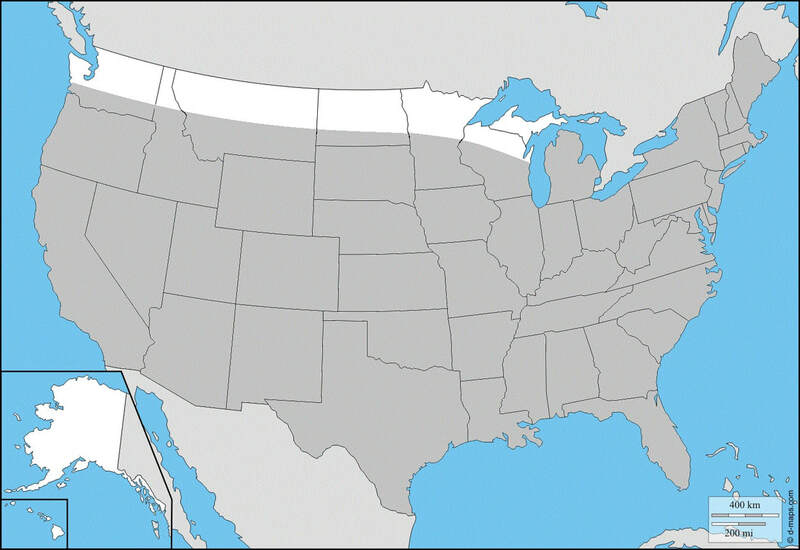 In most of the US, this species is found throughout the summer months. 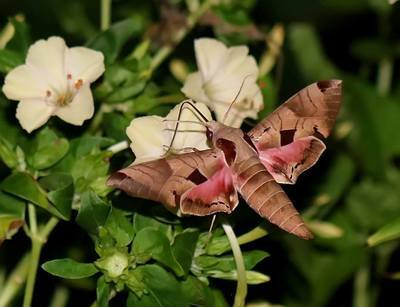 In Southern Florida and Texas and parts of the Gulf Coast, it can be on the wing nearly year-round. This species can be encountered in high numbers, especially in the Southwest. Peak flight for adults seems to be between 2200-0230 hours. Tuttle notes that in New England and the Upper Midwest this moth is univoline (2). 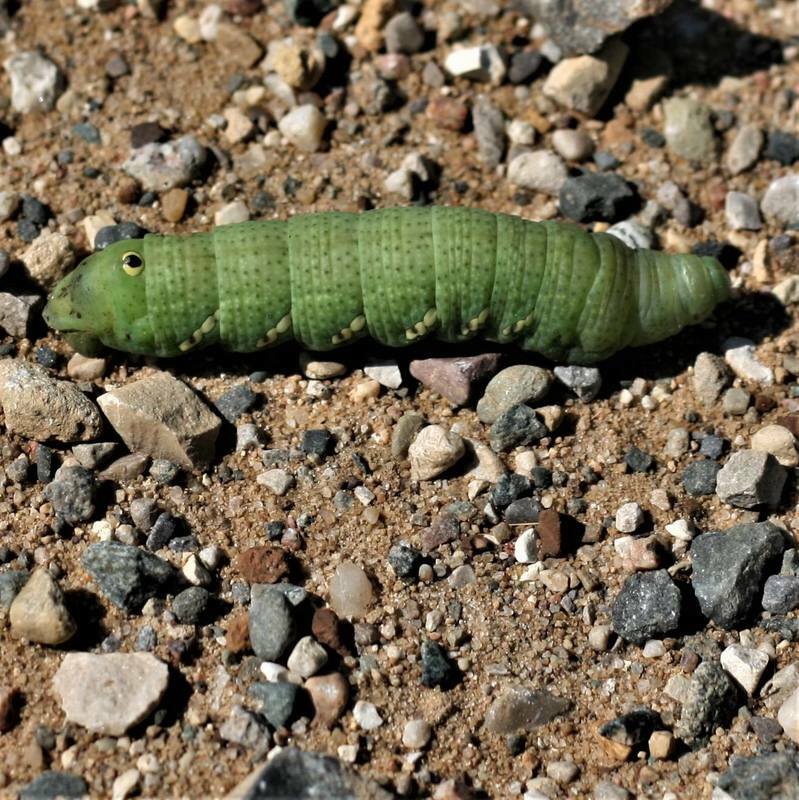 In Massachusetts, especially along the coast, larvae can be recovered from early July through October hinting at multiple broods (1). 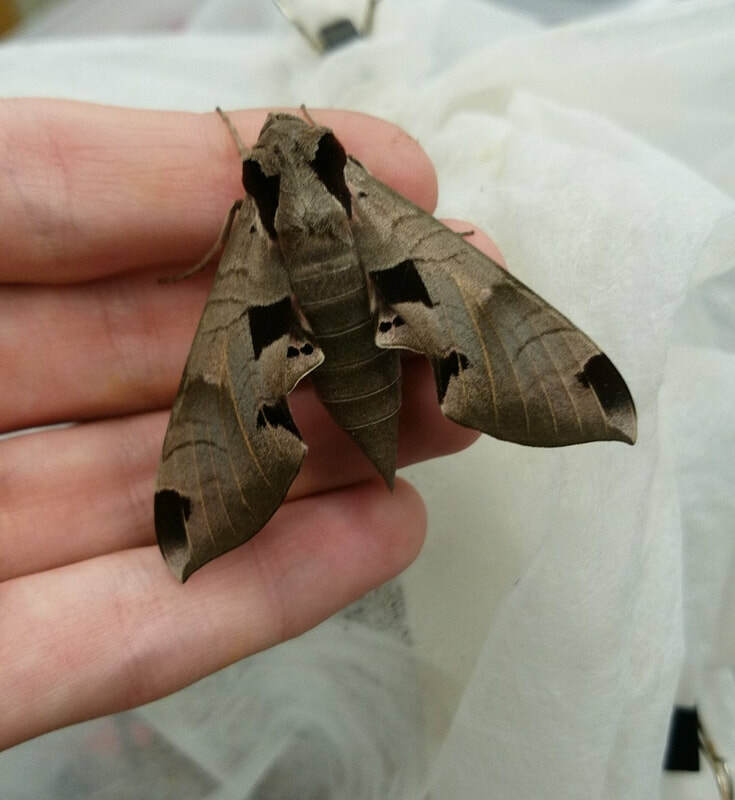 Rearing of moths from this state can produce multiple generations in captivity even when reared outdoors in sleeves (1). Habitat/Searching for Larvae: Like many Vitacea feeding sphingids, this is not an insect often encountered in dense woodland. The best places to find larvae seem to be suburban-rural locations. 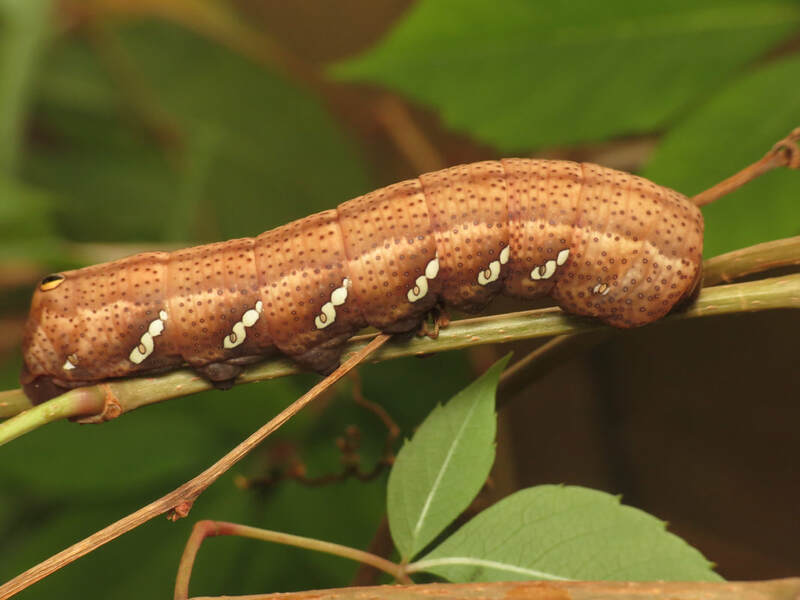 Many caterpillars of this species have been found by searching Grape and Virginia Creeper vines growing over fences in suburban neighborhoods. Adults have also been encountered laying eggs on sprawling vines on dunes (1). Larvae are quite easy to find when you find a decent stand of hostplant. 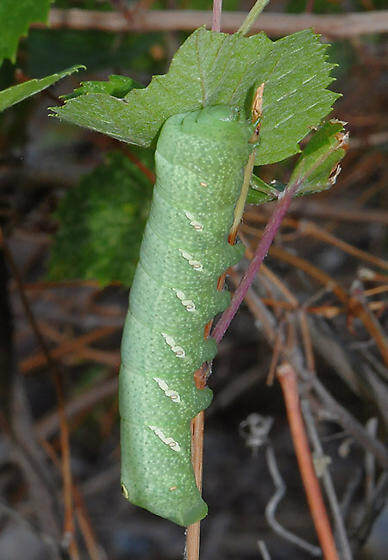 Young larvae tend to feed on new growth, using their small caudal horn to blend in with the tendrils of the hostplant. 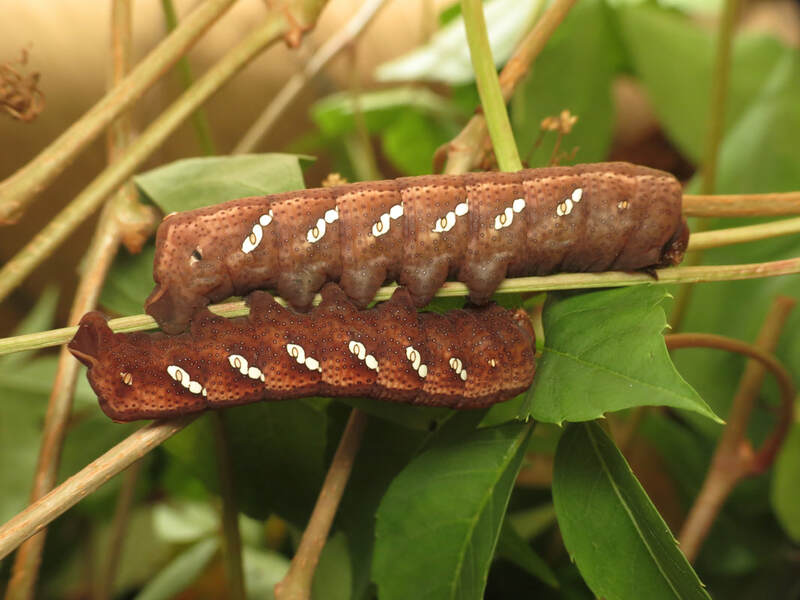 In a dry wash in Southeastern Arizona, several dozen larvae were encountered on one large Vitis arizonica plant. This larva glows exceptionally well under UV light, especially as younger instars. Full grown larvae do fluoresce, but not as well depending on the color-morph. Rearing Notes: This species is incredibly easy to rear in captivity and may be the easiest Eumorpha to rear in captivity. Adults will mate and lay eggs in captivity, even in smaller flight cages. 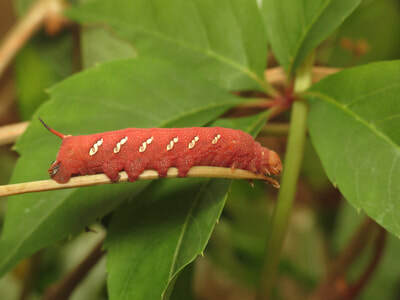 The larvae accept almost any species of Vitis and Parthenocissus. 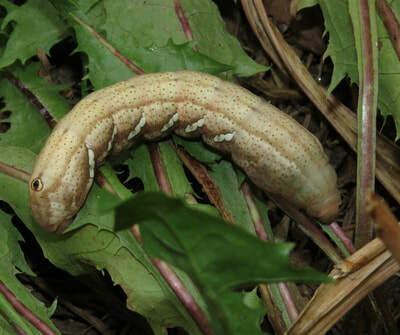 Larvae should not be kept too crowded at later instars. 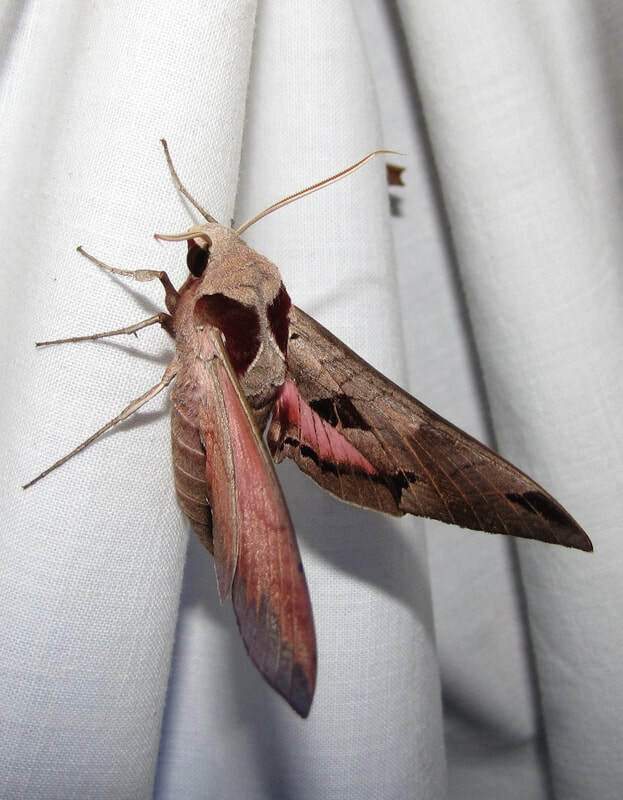 Unlike many species of Sphingidae, it appears that Eumorpha achemon will continuously brood if given the opportunity and correct environmental factors. Northern populations of this species will easily break diapause if you supply them with light and heat. Adult description: This is the smallest moth in the genus Eumorpha in North America with forewings only 42-49mm in length (2). 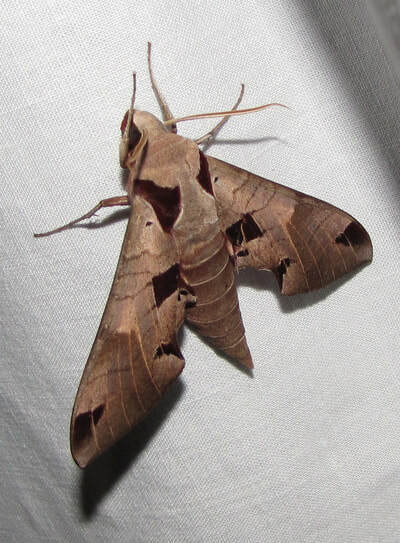 The base color of the body and forewings is brown with a black basal rectangular area. Large dark brown triangles are present on the sides of the thorax. The hindwings of this species are a salmony pink. This combination of features makes it unmistakeable in the US. 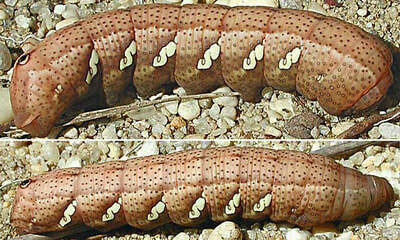 L1: First instar larvae are small green hornworms with an extraordinarily long red horn and somewhat oversized head. 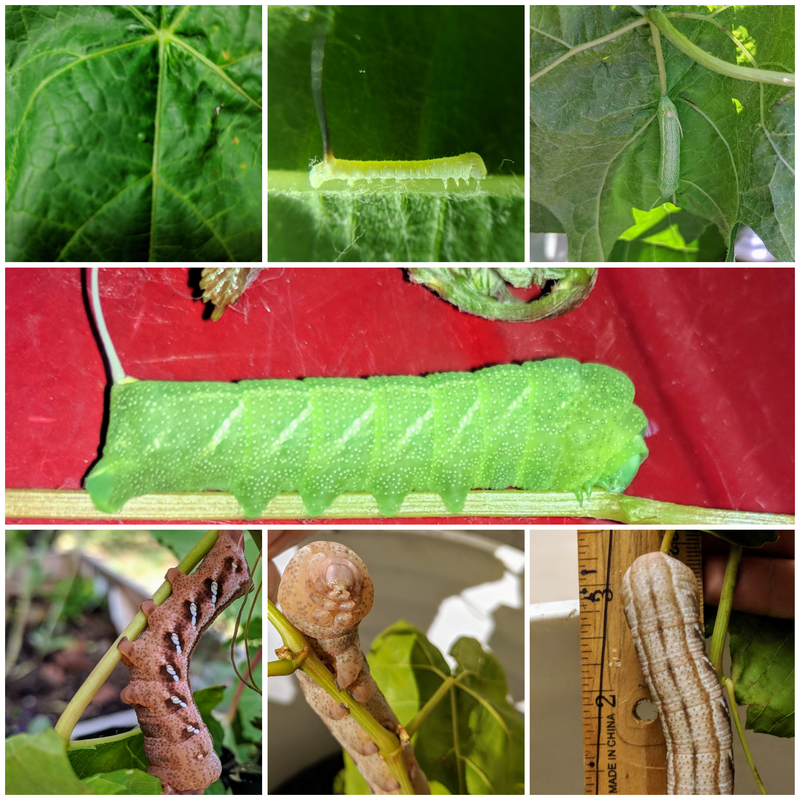 L3: At this stage, the larvae look quite different. The long straight horn now curves and looks strikingly similar to a Parthenocissus quinquefolia tendril. The larvae are green or red in color, with a white horizontal line down the length of their body. A series of diagonal lines bisect the spiracles on each abdominal segment. 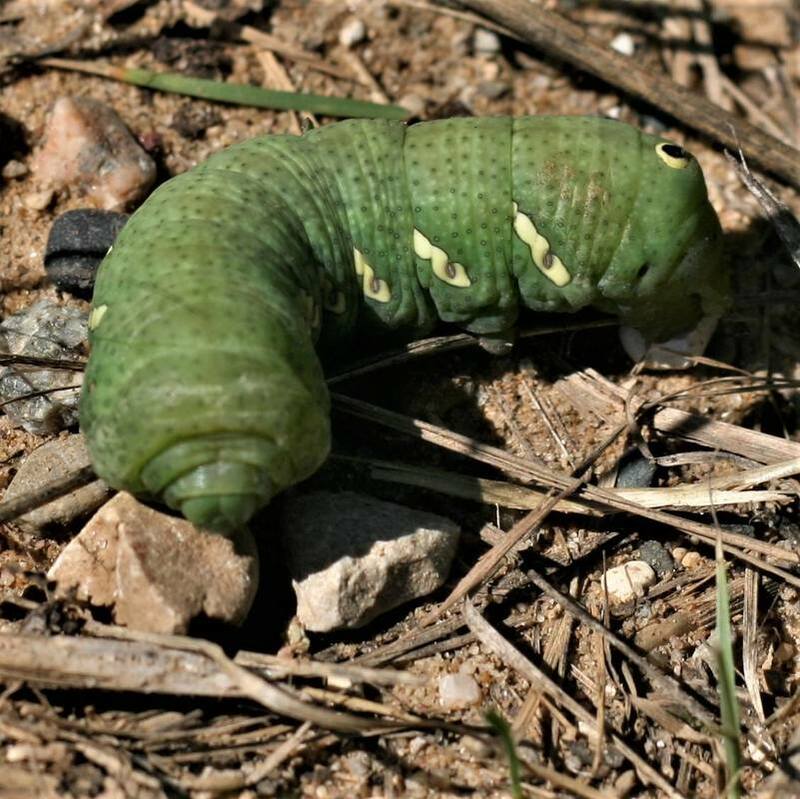 L4: The larva now loses the horn entirely, replacing it with a small hard eyespot like mark. The area can sometimes appear raised. The larva can rear its body up, and contract it’s thoracic segments back into the swollen A1 segment to give it a more menacing appearance. The larvae are red or green in color. There are several eyespots connected together that can sometimes resembles lines bisecting the spiracles on each abdominal segment. L5: Superficially resembling the larvae of E. pandorus, the easiest way to distinguish larvae is by looking at the eyespots on each of the abdominal segments. If the eye spot is large and distinctive, you have E. pandorus. If the eye spots are more like a streak, or resembling three smaller circles placed together, you have E. achemon. The larvae of this species don’t have quite as many color morphs, usually only a green, a dark red, and light red forms. In the Southwest, this species can be separated from Eumorpha typhon by the yellowish button where the caudal horn used to be and by the overall black speckling. In Eumorpha typhon the button where the caudal horn was is reddish and the overall speckling is whitish. Eumorpha typhon also has more solid rectangles of color on each abdominal section and these are usually yellow-cream in color rather than white. The gallery to the left contains photos of Eumorpha achemon adults. If you have a photo that you would like to submit to us, please contact us. The gallery to the right contains photos of Eumorpha achemon larval and pupal stages. If you have a photo that you would like to submit to us, please contact us. L5 (C) William J. Lucas, Jr.